Joseph Fidler Walsh (born November 20, 1947) is an American singer, guitarist, and songwriter. 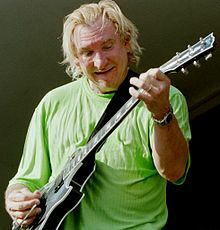 In a career spanning more than forty years, he has been a member of five successful rock bands: James Gang, Barnstorm, Eagles, the Party Boys, and Ringo Starr & His All-Starr Band. Walsh was also part of the New Zealand band Herbs (band). In the 1990s, he was a member of the short-lived supergroup the Best.